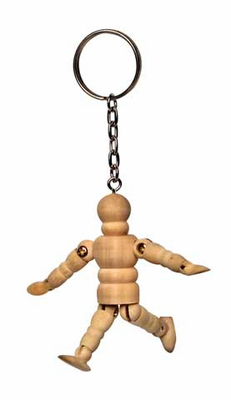 Home > Drawing Supplies | Art Mannequins, Skeletons & Other Drawing Models | Human Figure Manikins | Art Alternatives MANIKIN KEYCHAIN 2 1/2"
Art Alternatives MANIKIN KEYCHAIN 2 1/2"
Make your love of drawing statement with this manikin keychain. This is the perfect chance for you to make that artistic statement with a unique one of a kind custom keychain. With this miniature manikin – called artsy – you can have your own side-kick follow you everywhere you go. The micro manikin measures 2-1/2” making it perfect for carrying around with a set of keys, not too small to get easily lost and not too big to become a bother. The manikin is made entirely of wood making it very light and ultraportable. You can easily customize it to bring out your personality. You can paint the wooden mini manikin with your favorite colors or even your country’s colors to show your patriotism. It could act as a great accessory for your backpack, purse, and all types of keys.